Why should anyone need instructions on listening to audiobooks on an iPod … this should just work, right? This tip is not about downloading the audiobooks, or installing them on your iPod. This is about accessing and playing them once they are in your iPod. You’ve bought your audiobooks, you’ve put them in iTunes, you’ve synced your iPod. iTunes says your audiobooks are synced. Now, you’re looking at your iPod, and where the heck are they? By default, they don’t seem to appear anywhere except maybe (temporarily) in “Recent Items”. �They don’t appear anywhere under Music, and since they aren’t music, that sort of makes sense. There really ought to be an Audiobooks item, right alongside Music and Photos. Here’s how to get one. Begin at your iPod main menu. Go into the Settings Menu. Now, select Main Menu. What a �confusing name. This isn’t returning you to the main menu, it’s editing the settings for the main iPod menu. Make sure Audiobooks is On, or has a checkmark. You may have to scroll down a bit, but you should see an option named Audiobooks. Select it to turn it on. You should see the word Off change to On, or you should see a checkmark appear. 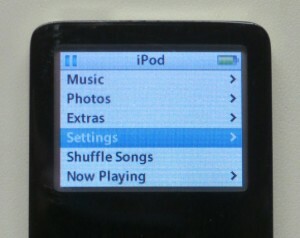 Now, press the iPod menu button twice to return to the iPod menu. You should now see a new item there, Audiobooks. All your audiobooks will be in there. I really don’t approve of Apple’s policy of hiding menu items until they are needed, or in this case until the user is at his wit’s end, and searches the internet for an answer, and finally has to dig into Settings to enable something that should have been there all along. �Frankly, I’m hoping that this hide-and-seek with the menus was some sort of Steve Jobs quirk, and that it will be laid to rest along with him. 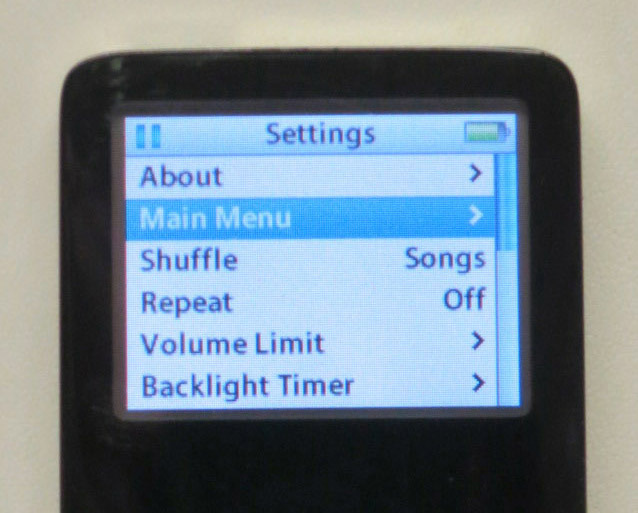 Apple really needs to fix this in the iPod firmware, or maybe in iTunes. 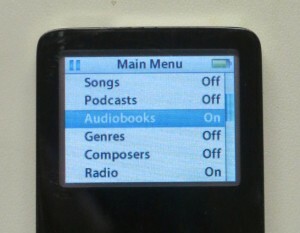 If nothing else, when audiobooks exist on an iPod, this menu item should be turned on automatically.